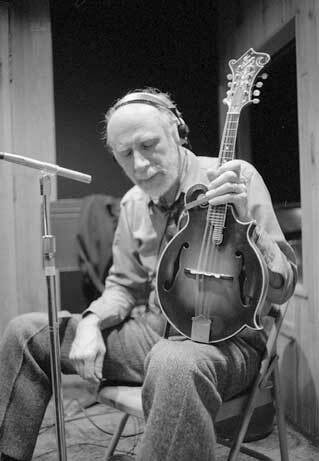 A man of great achievement as a musician, folklorist, artist manager, impresario, publisher, and producer, Ralph Rinzler rose to prominence in the 1950s as a member of the Greenbriar Boys and was soon showing up as a supporting musicians on other artists’ album. In 1998 he won a Grammy as a producer of Folkways: A Vision Shared, a benefit album celebrating the Folkways label’s 40th anniversary with the likes of Bruce Springsteen, Emmylou Harris, Taj Mahal, Little Richard and others performing the songs of Lead Belly and Woody Guthrie. HE was a co-founder of the annual Smithsonian Folklife Festival held on the Washington, D.C. Mall every summer, and served the Smithsonian as a curator for American art, music, and folk culture. Smithsonian Folklife Festival at a recording session in 1988, by Dane Penland, Photographic print, Smithsonian Institution Archives, Accession 98-015, Box 2, Folder: August 1994, Negative number: 88-1476-20. As Rinzler recounted to Richard Gagné: Monroe is this giant, whose songs had been recorded by Elvis Presley, and who had been on the Grand Ole Opry 20-some years, he was like a nova, I mean people were astonished with him. But he couldn't make a living because Flatt and Scruggs had sewed up the whole business with the Ballad of Jed Clampett, Bonnie and Clyde, and the Beverly Hillbilly stuff... Trying to get Monroe to talk to you, he just didn't want to be interviewed. But I was determined. It took me three months to get an interview from him. And publish it in Sing Out! And when you finally sat down to talk to him, even as reluctant as he was about the idea of being interviewed, he answered every question very diligently. And at the end of the interview I said, "Is there anything you've said that you don't want to see in print?” And he just looked up and he said, "Well, it's all true." And then, all of a sudden, after accepting the role of patriarch, he would talk about his Uncle Pen [Pendleton Vanderver], and about retuning the mandolin into fiddle tunings that his uncle used. And he would talk about a concept that he had about “old tones,” which meant modal, mostly, for him. So working with those kinds of artists, who were really among the greatest musicians of their time, was an exercise in getting the best out there. Because Monroe couldn't make three or four hundred dollars a night at the beginning of this experiment, but he was soon just cleaning up. But it took getting the folk song audience to understand that he was as folk as he was Nashville. And to give them the actual facts of who he learned from and how and what his philosophy was. And once he realized that people were interested in his ideas, he was very voluble on the stage and very gracious. “The reason Bill was in the dumps in the fifties was the takeover of rock and roll at the time of Elvis Presley, and it threatened all of country music for a while. Another factor was that Flatt and Scruggs had cornered the marked on what was left. “Bill was left behind in the way that he was because he stuck hard by what he believed in, and he also had no business organization behind him. Mrs. Scruggs managed their business very shrewdly and the impression was created that bluegrass began and ended with Flatt and Scruggs. “By sixty-one Flatt and Scruggs had come north. Pete Welding wrote an article in Sing Out! about how Scruggs had made obsolete everything that had come before it and claimed him as the master of bluegrass music. I was furious and asked to do a story on Monroe. “None of us had ever talked to him. He was very aloof. I asked him if would give an interview and his reply was, “If you want to know anything about bluegrass, ask Louise Scruggs.” And he turned and walked away. Finally, however, his companion and bass player for many years, Bessie Lee Mauldin, and Carter Stanley persuaded him. “The one thing he was extremely aware of was that he had fashioned his music. His music didn’t happen and it wasn’t intuitive. He consciously did it. The way a painter takes his brush and dips his brush into different colors on that palette, he can tell you exactly where he gets sound in his music. This Exhibit is the result of an invitation to visual artists to share their interpretation of a Bill Monroe song. Bill Monroe often painted images with his music and in this Exhibit artists have depicted their versions of these same images visually. Thirty-five artists responded to the invitation, with over sixty entries. The entries encompass many styles, from fine art to folk art. This is representative of the wide variety of people to whom Bill Monroe's music appeals. Gingham Rose by Rachael Sinclair, Louisville, Kentucky. Inspired by ‘My Rose of Old Kentucky.’ Acrylic on canvas. 19" x 23"/$400. 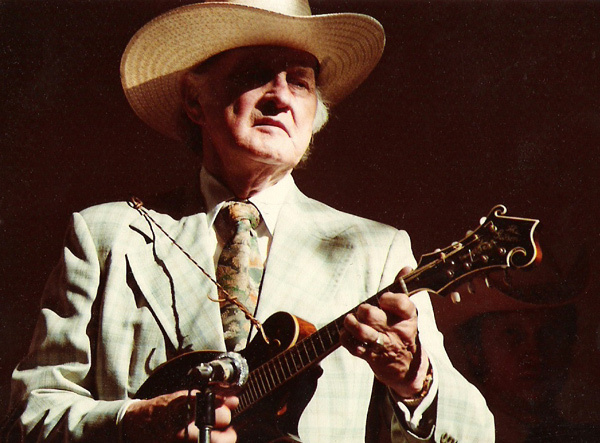 Most of the works of art submitted were inspired by the lyrics of a Bill Monroe song, while some were inspired by instrumentals; some were inspired by songs Monroe wrote, others by songs from other sources that Monroe covered and stamped as uniquely his. The pieces of art selected for the Exhibit are listed in this catalog in alphabetical order by artist. All the art on display in the Exhibit is available for purchase at the prices listed. Sixty percent of the proceeds will go to the artist and forty percent will go to the Museum. If you are interested in purchasing any of the artwork please contact Forrest Roberts at forrest@bluegrassmuseum.org. 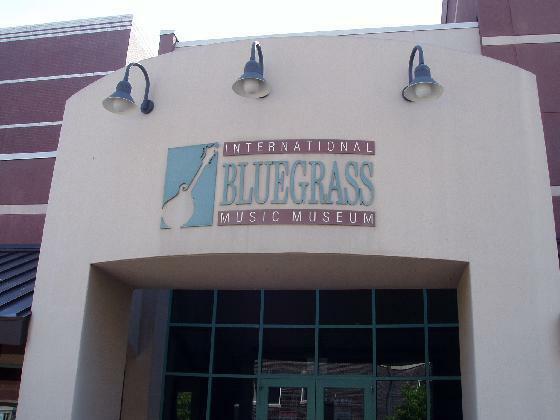 For more information on the Bill Monroe Centennial celebration festivities at the International Bluegrass Museum, visit the Museum website, and please make a donation to support its worthy effort to document the history and evolution of bluegrass and to promote the music to new generations.